Hey guys! Just wanted to share with you how this window treatment came out. It's called a "relaxed roman shade." It's constructed similarly to a roman shade, but without the dowels. This allows soft curves and "swooping." 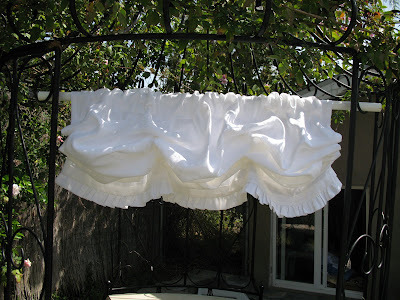 It is made out of a gorgeous pure white linen and finished off with a 2 inch ruffle along the bottom. Perfect for softening a window without blocking too much light. Love it! This bolster was made for a pair of adorable newlyweds looking to add some softness and elegance to the boudoir. The over-sized bolster lay in front of three squishy floral pillows and gave just the right finishing touch to their master bedroom ensemble. The joining of their lives as man and wife is symbolized by the joining of their initials-- "M" for Michael, "K" for Kelly, and "C" for Chiriatti. How fun! 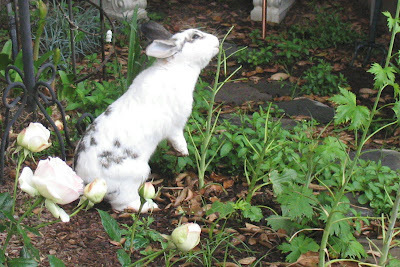 Meet Buttercup our resident bunny! Isn't she cute? Buttercup has the run of the surrounding homes in my neighborhood. There's nothing sweeter than to see her nibbling on the foliage. She reminds me to "stop and smell the roses." 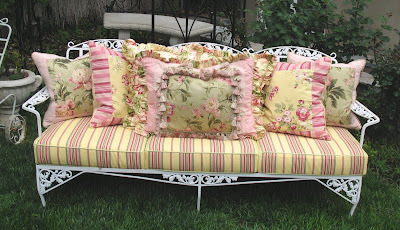 This week I had the pleasure of making some cushions for a friend who has a fabulous outdoor living room. Her color palette includes vibrant yellow, limey greens, and deep reds and pinks. The multicolored stripe sets the backdrop for a fun mix of throw pillows. Do you have a hankering for a garden oasis? Let me help you create a destination for relaxation in your own back yard!